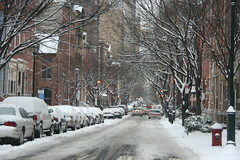 What was originally forecast as a dusting to 3 inches in Philly blanketed Center City with 4 to 6 inches today, closing over 800 schools and snarling traffic. It also caused breathlessness in weather and traffic casters as they struggled to impart the proper degree of seriousness to the impending doom posed by the weather event of the year. At area workplaces not idled by the weather, employees took advantage of the opportunity to stretch "casual Friday" to the max, appearing in jeans, snow boots and other otherwise banned attire. Bosses across the region also endured various excuses from folks who claimed to be "working from home." Fights were reported at dozens of area convenience stores as grandmothers fought over milk, bread and eggs. Thousands of families had French toast for breakfast and will munch on grilled cheese and tomato soup for lunch. Area emergency rooms have been inundated with middle-aged men complaining of chest pain after being exposed to their wives and children cooped up in the house for hours watching Barney. Area air pollution figures spiked this morning as thousands of lazy fat guys rolled out their snow blowers for the first time in three years, saying it was "about time they got their money's worth out of the damn thing." For those of you stuck at work like me, enjoy the commute home when the streets will be glazed with "black ice" and your car will be coated with freezing rain, causing "numerous fender-benders" and "snarling traffic" yet again. I'm sure it will be covered live from about 2:30 on as the area "gets an early start on rush hour." LOL what an accurate picture you paint!! And that photo is terrific!!! I'm home with the boys - snowed in. Enjoy! UArts casual Friday. Now that sounds interesting. Oh yes - one of the many thrills of working at the U! !